This is a killer differentiator. The PlayBook has a 3-megapixel user-facing camera and a 5-megapixel rear-facing camera. The main camera can also shoot 1080p HD video. The iPad has no cameras at all. RIM wins this one hands down. The PlayBook comes with both microHDMI and microUSB ports. That means users have a wider choice when it comes to sharing content from the PlayBook with other devices. The HDMI port, in particular, sets the PlayBook ahead of the iPad, which is limited to Apple’s 30-pin proprietary connector. According to Research In Motion, the BlackBerry PlayBook supports all the enterprise security and policy enforcement controls that can be applied to all existing BlackBerries. That’s vital. If the QNX-based tablet shipped with a brand new OS that wasn’t backward compatible with BlackBerry Enterprise Server, it might be D.O.A. in the enterprise. Instead, RIM did the smart thing and made sure it is as easily controlled as are its BlackBerries. 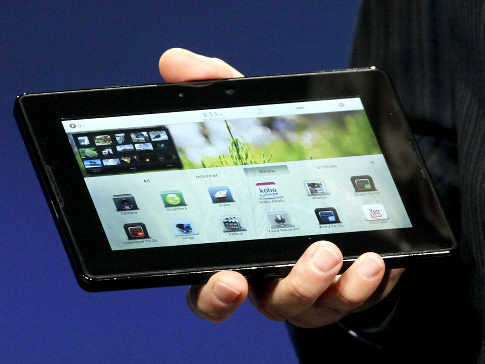 The PlayBook has a 7-inch display with a 16:9 aspect ratio. Similar to the Samsung Galaxy Tab, it is small enough to be carried around in a (large) pocket. The iPad’s 9.7-inch display makes in unpocketable. Size does matter, and sometimes not in the way you might think. The PlayBook is smaller and easier to transport than the iPad, plain and simple. The PlayBook has a 1GHz dual-core processor with multi-symmetric processing. The iPad has a single core 1GHz processor. We haven’t seen any benchmarks yet, but two cores is twice as good, right? RIM claims the PlayBook is the “Fastest. Tablet. Ever.” We’ll have to see just how fast it is once it is available for sale.